1) Recently got attached setup (Olympus camera, Nauticam housing and Z240 strobes). With this configuration I noticed that the handle bars are wobbly. So I'm considering adding a bracket across the top of the two handle bars to add stiffness. Does anyone know of a bracket for this nauticam setup (the housing and arms are nauticam) that would do the trick? Would I need to make one myself? 2) on land, gravity makes the setup heavy, especially with the strobes apart as in the image. On land this requires the clamps to be tightened alot, so it is very hard to adjust the position of the arms. 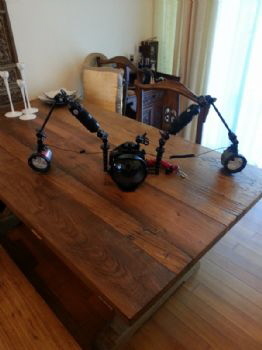 Would this be resolved by attaching the floating arms close to the strobes? Is there another way? (I was told that the dome on this camera makes the housing quite buoyant, which implies that floating arms close to the body is not required, but floating arms close to the strobes may be appreciated...). My recommendation would be to approach Nauticam for advice on properly securing the "wobbly"arms. Next, do not carry your camera system with the strobes deployed out of the water. Everything should be folded every time you enter/exit the water and only deploy your strobes in the water. Above all else, make sure your buoyancy skills in the water without a camera system are excellent. As a goal, you should be able to "hover"within a foot (up or down) of a chosen depth while doing simple tasks (i.e.) write on a slate or pass small equipment back and forth with a buddy. Once you can do that, introduce the camera system in a controlled environment (pool) and make any small changes to your trim/buoyancy. Cameras and strobes are a significant task load for a diver. If you are struggling with any equipment (dive gear or camera) your'e not thinking about taking photos. Trust this helps and I look forward to seeing your work. The model you share is quite unique and strange, I want to know more about its working mechanism.